When Ambassador Christopher Stevens was killed in Benghazi on September 11, he became the victim of a stray bullet from the past fired by an enemy the United States helped create. Today’s debate over what levels of security might have prevented the tragedy is a distraction from the real story of how American meddling in Libya set the stage for the assassination. This historical amnesia was on full display during the second presidential debate, in which the candidates clashed over a question even less relevant than the security issue: how many days it took Obama to label the attack an “act of terror.” Even by the low standards of America’s diminished political attention span, the controversy over the embassy attack playing out in the media is remarkable for its total lack of historical context. To understand the roots of the crisis in Libya, after all, would mean examining how, for years, the United States helped Col. Muammar el-Qaddafi and other Arab leaders hold on to power and terrorize their opponents anywhere in the world, in the name of the “war on terror.” It would mean exposing successive administrations’ rendition and torture policies, and their collusion with despotic Arab regimes to carry them out. Though many Arabs targeted by the United States remained focused exclusively on challenging the regimes in their home countries—and refused to harm civilians to achieve their aims—some came to regard the United States, its assets and civilians as legitimate targets in some circumstances. Among these appear to be some members of the Benghazi-based group Ansar al-Sharia. A leading member, Ahmed Abu Khattala, was identified on October 17 as the prime suspect behind the killing of Ambassador Stevens. Khattala was imprisoned under Qaddafi at the notorious Abu Salim prison in Tripoli, where a piece of the history linking the United States and Libya is visible as an observation scrawled on the wall of a ruined cell: “Life [imprisonment] in Guantánamo is not even a day in Abu Salim.” The comparison is apt. These two facilities—one run by the US military, the other by Qaddafi’s men—essentially became a part of the same network of secret prisons. The US rendition program that used these prisons grew out of long-term collaborations between the United States and its partners in ousted Arab regimes. It began under President Clinton as an arrangement with Egypt, whereby the CIA would capture exiled opponents of the Mubarak regime and render them back to Egypt for detention, torture and often death. After 9/11, the program was dramatically expanded by George W. Bush to include a network of extraterritorial US-run prisons and proxy detention sites around the world. In Libya, reams of documents uncovered by the revolution have revealed just how closely the Bush administration and Qadaffi’s regime were cooperating in the rendition and secret detention of Libyans. 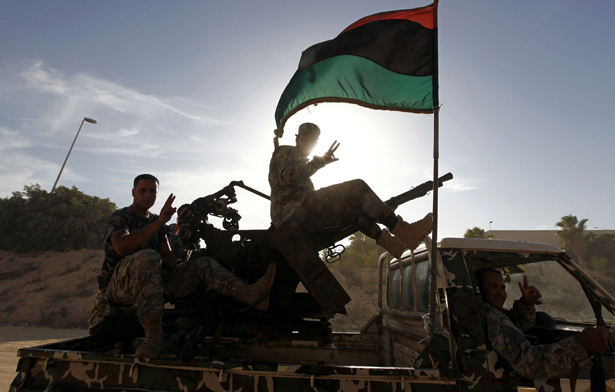 Many were members of the Libyan Islamic Fighting Group, which was unconnected to Al Qaeda and whose sole aim was to oust Qaddafi. Abu Salim prison held many members of the LIFG, captured by the United States and rendered to Libya via a series of secret US torture centers. The most famous of Abu Salim’s prisoners, at least to those outside Libya, was Ali Mohammed al-Fakheri, otherwise known as Ibn al-Shaykh al-Libi. Captured in Pakistan in November 2001 and rendered to Egypt, he was tortured into claiming that Al Qaeda and Saddam Hussein were collaborating to develop chemical weapons—statements that were used to justify the invasion of Iraq. But, as was clear, al-Libi was not a member of Al Qaeda, and his information was false. Neither were other Libyan rendition victims handed over to Qaddafi allied with Al Qaeda: most were members of the LIFG—and many have played a central role in the US-supported Libyan revolution and reconstruction. Al-Libi was found dead in his cell in 2009. Libyan authorities claimed suicide; others believe he was murdered. Had he lived to see today’s Libya, we could have learned the details of his detention and torture in Egypt. He might also have reminded us why he and his compatriots in Afghanistan—Arabs opposed to the regimes in their various home states—settled there in the first place. It was largely because throughout the 1980s and early ’90s, America financed and trained the mujahedeen in Afghanistan, mainly composed of exiled Arabs, to fight the Soviets. After the Soviets retreated, many couldn’t go home because the dictatorial regimes in their countries would not tolerate them, especially now that they had combat training. And thus began the blowback: after Afghanistan, some of the mujahedeen turned their new skills toward ousting their home regimes. It was essentially in an effort to contain this unintended consequence of building up the mujahedeen in Afghanistan that the first US rendition program was born. The Obama administration has continued some of these practices and emphatically failed to address past abuses. Most Libyans are clearly grateful for the role the United States chose to play in their revolution. But that, unfortunately, is not enough. Unaddressed, such constant, contradictory meddling in foreign affairs has long-term consequences that cannot be undone overnight. It helps create power vacuums, in which over time new enemies flourish—people who refuse to play the game and recognize even a temporary confluence of interest with this or that capricious superpower. The death of Ambassador Stevens is testament to this. Wayne Barrett details how the Romney campaign and the media colluded in an unprecedented politicization of Benghazi attack.